Some people believe it will change our world for the better, and it will replace the banks that we currently know – or similar extravagant things. Note: In this guide, I’ll be explaining how the concept of the blockchain works – I won’t be explaining how the blockchain technology is implemented in detail, as that’s beyond the scope of this article. Blockchain is the technology that enables the movement of digital assets – Bitcoin, for example – from one individual person to another individual. In addition, the blockchain aims to complete this process much faster than the current system – almost instantly! “A company’s set of numbered accounts for its accounting records. The ledger provides a complete record of financial transactions over the life of the company. The blockchain is – you guessed it – a chain of blocks. A hash is always unique – it contains a string of random letters and numbers. The unique string basically holds the information of what content is stored in the block. When a block is created, the unique hash that belongs to the block is then calculated. When something in the block changes – for example, if the number of bitcoins goes down by 2 – the hash will also change. That means that if you were to interfere with or change one block in the chain, you would need to recalculate all the following blocks in the chain, 1 per 10 minutes – which is way too time-consuming and expensive. In sum, the implementation of blockchain is incredibly detailed and complex, but my explanation of the concepts and ideas – in plain english – should already answer a lot of your questions. This is the first blog in a series of 5 that explore the new world of digital delivery strategy. The landscape for content distribution has changed dramatically over the past few years. Mobile, Chat, Voice, TV, Desktop are all channels where customers are nowadays and, consequently, where businesses should have a meaningful presence. The average smartphone user in the US downloads zero new apps a month and spends most of their time in less than just five apps [source]. While the App market is far from dead (197 billion app downloads in 2017 alone), what are the chances that your App will actually get noticed by your target audience? 65% of smartphone owners are using phones with a storage capacity of 16GB or less and 52% reach the level of insufficient storage ever week [source]. How useful should an App be to deserve space in a user’s devices? Is your business ready or at least planning to have a meaningful presence on Chat and Voice channels? And what about other alternative channels with their own stores, rules and ecosystems? Let’s quickly look at the use case of the travel industry to illustrate just how multi-channel today’s consumers are. Travellers at the airport are usually quite interested in knowing the status of their flight and information about their departing gate. Some are frequent travellers so are likely to have the Airline App installed; others fly once per year and a mobile web experience is more than fine for them, but still would like to receive push notifications and not get a ‘downasaur’ if they are on a cellular network blind spot. Finally, there are others who, for example, have previously engaged with the Airline via Facebook Messenger to ask about their baggage allowance and now they’d love to get updates on that channel. Same information, different users, different channels. Businesses should be where their (potential) customers are. Can today’s businesses afford to address all those channels directly without a form of cross platform development strategy? Yes of course, but doing so would be inefficient, timely and most importantly, costly. Just a few years ago cross platform development mostly referred to tools and programming languages that could deliver exclusively to iOS and Android platforms with (almost) a single source. Today this idea of cross platform seems out of date. Like with any cross-platform approaches there is the need to identify a leverage point. For some products the leverage is a low level programming language capable of running in multiple platforms, or a clever transpiler capable of producing the right binary for the target platform. Web technologies and tools are pervasive, powerful and widely known and adopted. Among many great technologies the followings have been chosen for further exploration in the direction of the omni-channel vision. The ‘learn once, write everywhere’ philosophy seems very aligned to the omni-channel vision. Plus the component oriented design it proposes is considered an advantage compared to other MVC solutions. The wide and active community also plays a strategic role. React also features as the most loved, dreaded and wanted framework on StackOverflow’s 2017 survey with 70% of preferences. Being capable of using graphs to represent and expose domain content, and letting clients query and traverse the data as they need is considered a game changing advantage to fixed APIs and Models in the omni-channel context. This is particularly true for non-GUI based channels such as Voice and Chat channels and it will be explored in future blog posts. The enabling technology allowing a script to run on a browser independently from the webpage, opening the doors for Offline, Background Synch and Push on Mobile Web. Service Workers are at the heart of what usually goes under the name of Progressive Web Apps. In order to stay relevant, the digital delivery strategy of businesses over the next 5 years should be very different from what it has been over the past 5. This series of articles goes through a technological exploration which has the Web Channel and Web technologies at its core. Stay tuned! … and share your thoughts on comments. This article is a gentle introduction to blockchain technology and assumes minimal technical knowledge. It attempts to describe what it is rather than why should I care, which is something for a future post. What’s the difference between a blockchain a a normal database? Very loosely, a blockchain system is a package which contains a normal database plus some software that adds new rows, validates that new rows conform to pre-agreed rules, and listens and broadcasts new rows to its peers across a network, ensuring that all peers have the same data in their databases. As a primer on bitcoin, it may help to review A gentle introduction to bitcoin. The Bitcoin Blockchain ecosystem is actually quite a complex system due to its dual aims: that anyone should be able to write to The Bitcoin Blockchain; and that there shouldn’t be any centralised power or control. Relax these, and you don’t need many of the convoluted mechanisms of Bitcoin. That said, let’s start with The Bitcoin Blockchain ecosystem, and then try to tease out the blockchain bit from the bitcoin bit. Replicated databases. The Bitcoin Blockchain ecosystem acts like a network of replicated databases, each containing the same list of past bitcoin transactions. Important members of the network are called validators or nodes which pass around transaction data (payments) and block data (additions to the ledger). Each validator independently checks the payment and block data being passed around. There are rules in place to make the network operate as intended. Bitcoin’s complexity comes from its ideology. The aim of bitcoin was to be decentralised, i.e. not have a point of control, and to be relatively anonymous. This has influenced how bitcoin has developed. Not all blockchain ecosystems need to have the same mechanisms, especially if participants can be identified and trusted to behave. There is a big difference in what technologies you need, depending on whether you allow anyone to write to your blockchain, or known, vetted participants. Bitcoin allows anyone to write to its ledger. Usually, when people talk about public blockchains, they mean anyone-can-write. Because bitcoin is designed as a ‘anyone-can-write’ blockchain, where participants aren’t vetted and can add to the ledger without needing approval, it needs ways of arbitrating discrepancies (there is no ‘boss’ to decide), and defence mechanisms against attacks (anyone can misbehave with relative impunity, if there is a financial incentive to do so). These create cost and complexity to running this blockchain. Private blockchains. Conversely, a ‘private’ blockchain network is where the participants are known and trusted: for example, an industry group, or a group of companies owned by an umbrella company. Many of the mechanisms aren’t needed – or rather they are replaced with legal contracts – “You’ll behave because you’ve signed this piece of paper.”. This changes the technical decisions as to which bricks are used to build the solution. See the pros and cons of internal blockchains for more on this topic. Warning: this section isn’t so gentle, as it goes into detail into each of the elements above. I recommend getting a cup of tea. DATA STORAGE: What is a blockchain? A blockchain is just a file. A blockchain by itself is just a data structure. That is, how data is logically put together and stored. Other data structures are databases (rows, columns, tables), text files, comma separated values (csv), images, lists, and so on. You can think of a blockchain competing most closely with a database. information about itself: at the top of the page there is usually the title of the book and sometimes the chapter number or title; at the bottom is usually the page number which tells you where you are in the book. This ‘data about data’ is called meta-data. the contents of the block, for example in bitcoin is it the bitcoin transactions, and the miner incentive reward (currently 25 BTC). a ‘header’ which contains the data about the block. In bitcoin, the header includes some technical information about the block, a reference to the previous block, and a fingerprint (hash) of the data contained in this block, among other things. This hash is important for ordering. Blocks in a chain refer to previous blocks, like page numbers in a book. See this infographic for a visualisation of the data in Bitcoin’s blockchain. Page by page. With books, predictable page numbers make it easy to know the order of the pages. If you ripped out all the pages and shuffled them, it would be easy to put them back into the correct order where the story makes sense. Block by block. With blockchains, each block references the previous block, not by ‘block number’, but by the block’s fingerprint, which is cleverer than a page number because the fingerprint itself is determined by the contents of the block. The reference to previous blocks creates a chain of blocks – a blockchain! Internal consistency. By using a fingerprint instead of a timestamp or a numerical sequence, you also get a nice way of validating the data. In any blockchain, you can generate the block fingerprints yourself by using some algorithms. If the fingerprints are consistent with the data, and the fingerprints join up in a chain, then you can be sure that the blockchain is internally consistent. If anyone wants to meddle with any of the data, they have to regenerate all the fingerprints from that point forwards and the blockchain will look different. A peek inside a blockchain block: the fingerprints are unique to the block’s contents. This means that if it is difficult or slow to create this fingerprint (see the “making it hard for baddies to be bad” section), then it can also be difficult or slow to re-write a blockchain. -> Having said that, the peer-to-peer data sharing mechanism, plus the fingerprinting makes it obvious when a participant tries to alter some data, if you keep track of the fingerprints. Here’s a piece on immutability in blockchains. DATA DISTRIBUTION: How is new data communicated? Peer to peer is one way of distributing data in a network. Another way is client-server. You may have heard of peer-to-peer file sharing on the BitTorrent network where files are shared between users, without a central server controlling the data. This is why BitTorrent has remained resilient as a network. In the office environment, often data is held on servers, and wherever you log in, you can access the data. The server holds 100% of the data, and the clients trust that the data is definitive. Most of the internet is client-server where the website is held on the server, and you are the client when you access it. This is very efficient, and a traditional model in computing. In peer-to-peer models, it’s more like a gossip network where each peer has 100% of the data (or as close to it as possible), and updates are shared around. Peer-to-peer is in some ways less efficient than client-server, as data is replicated many times; once per machine, and each change or addition to the data creates a lot of noisy gossip. However each peer is more independent, and can continue operating to some extent if it loses connectivity to the rest of the network. Also peer-to-peer networks are more robust, as there is no central server that can be controlled, so closing down peer-to-peer networks is harder. With peer-to-peer models, even if all peers are ‘trusted’, there can be a problem of agreement or consensus – if each peer is updating at different speeds and have slightly different states, how do you determine the “real” or “true” state of the data? Worse, in an ‘untrusted’ peer-to-peer network where you can’t necessarily trust any of the peers, how do you ensure that the system can’t easily be corrupted by bad peers? CONSENSUS: How do you resolve conflicts? A common conflict is when multiple miners create blocks at roughly the same time. Because blocks take time to be shared across the network, which one should count as the legit block? Example. Let’s say all the nodes on the network have synchronised their blockchains, and they are all on block number 80. If three miners across the world create ‘Block 81’ at roughly the same time, which ‘Block 81’ should be considered valid? Remember that each ‘Block 81’ will look slightly different: They will certainly contain a different payment address for the 25 BTC block reward; and they may contain a different set transactions. Let’s call them 81a, 81b, 81c. Which block should count as the legit one? Longest chain rule. In bitcoin, the conflict is resolved by a rule called the “longest chain rule”. Treat the first block you see as legitimate. The “longest chain rule” is the rule that the bitcoin blockchain ecosystem uses to resolve these conflicts which are common in distributed networks. However, with a more centralised or trusted blockchain network, you can make decisions by using a trusted, or senior validator to arbitrate in these cases. See a gentle introduction to bitcoin mining for more detail. UPGRADES: How do you change the rules? As a network as a whole, you must agree up front what kind of data is valid to be passed around, and what is not. With bitcoin, there are technical rules for transactions (Have you filled in all the required data fields? Is it in the right format? etc), and there are business rules (Are you trying to spend more bitcoins than you have? Are you trying to spend the same bitcoins twice?). Rules change. As these rules evolve over time, how will the network participants agree on the changes? Will there be a situation where half the network thinks one transaction is valid, and the other half doesn’t think so because of differences in logic? In a private, controlled network where someone has control over upgrades, this is an easy problem to solve: “Everyone must upgrade to the new logic by 31 July”. However in a public, uncontrolled network, it’s a more challenging problem. With bitcoin, there are two parts to upgrades. Suggest the change (BIPs). First, there is the proposal stage where improvements are proposed, discussed, and written up. A proposal is referred to as a “BIP” – a “Bitcoin Improvement Proposal”. If it gets written into the Bitcoin core software on Github, it can then form part of an upgrade – the next version of “Bitcoin core” which is the most common “reference implementation” of the protocol. Adopt the change (miners). The upgrade can be downloaded by nodes and block makers (miners) and run, but only if they want to (you could imagine a change which reduces the mining reward from 25 BTC per block to 0 BTC. We’ll see just how many miners choose to run that!). If the majority of the network (in bitcoin, the majority is determined by computational power) choose to run a new version of the software, then new-style blocks will be created faster than the minority, and the minority will be forced to switch or become irrelevant in a “blockchain fork”. So miners with lots of computational power have a good deal of “say” as to what gets implemented. WRITE ACCESS: How do you control who can write data? In the bitcoin network, theoretically anyone can download or write some software and start validating transactions and creating blocks. Simply go to https://bitcoin.org/en/download and run the “Bitcoin core” software. The source code to this “Bitcoin core” software is published on Github: https://github.com/bitcoin/bitcoin. If you are so inclined, you can check the code and compile and run it yourself instead of downloading the prepackaged software on bitcoin.org. Or you can even write your own code, so long as it conforms to protocol. Ethereum works in a similar way in this respect – see a gentle introduction to Ethereum. Note that you don’t need to sign up, log in, or apply to join the network. You can just go ahead and join in. Compare this with the SWIFT network, where you can’t just download some software and start listening to SWIFT messages. In this way, some call bitcoin ‘permissionless’ vs SWIFT which would be ‘permissioned’. You may want to use blockchain technology in a trusted, private network. You may not want to publish all the rules of what a valid transaction or block looks like. You may want to control how the network rules are changed. It is easier to control a trusted private network than an untrusted, public free-for-all like bitcoin. DEFENCE: How do you make it hard for baddies? A problem with a permissionless, or open networks is that they can be attacked by anyone. So there needs to be a way of making the network-as-a-whole trustworthy, even if specific actors aren’t. What can and can’t miscreants do? *Well, he can, but only his version of the ledger will have this transactions. Other nodes will reject this, which is why it is important to confirm a transaction across a number of nodes. With transactions, the effect a dishonest miner can have is very limited. If the rest of the network is honest, they will reject any invalid transactions coming from him, and they will hear about valid transactions from other honest nodes, even if he is refusing to pass them on. With blocks, if the miscreant has sufficient block creation power (and this is what it all hinges on), he can delay your transaction by refusing to include it in his blocks. However, your transaction will still be known by other honest nodes as an ‘unconfirmed transaction’, and they will include it in their blocks. Worse though, is if the miscreant can create a longer chain of blocks than the rest of the network, and invoking the “longest chain rule” to kick out the shorter chains. This lets him unwind a transaction. Publish the longer chain. 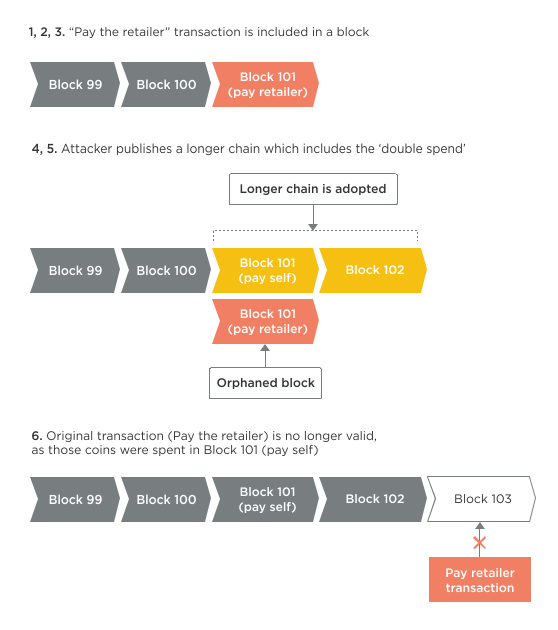 If the other nodes are playing by the “longest chain rule” rule, then they will ignore the honest block with the retailer payment, and continue to build on your longer chain. The honest block is said to be ‘orphaned’ and does not exist to all intents and purposes. This is called a “double spend” because the same bitcoins were spent twice – but the second one was the one that became part of the eventual blockchain, and the first one eventually gets rejected. How do you make it hard for dishonest miners to create blocks? Remember, this is only a problem for ledgers where block-makers aren’t trusted. Essentially you want to make it hard, or expensive for baddies to add blocks. In bitcoin, this is done by making it computationally expensive to add blocks. Computationally expensive means “takes a lot of computer processing power” and translates to financially expensive (as computers need to be bought then run and maintained). The computation itself is a guessing game where block-makers need to guess a number, which when crunched with the rest of the block data contents, results in a hash / fingerprint that is smaller than a certain number. That number is related to the ‘difficulty’ of mining which is related to the total network processing power. The more computers joining in to process blocks, the harder it gets, in a self-regulating cycle. Every 2,016 blocks (roughly every 2 weeks), the bitcoin network adjusts the difficulty of the guessing game based on the speed that the blocks have been created. This guessing game is called “Proof of work”. By publishing the block with the fingerprint that is smaller than the target number, you are proving that you did enough guess work to satisfy the network at that point in time. INCENTIVES: How do you pay validators? Transaction and block validation is cheap and fast, unless you choose to make it slow and expensive (a la bitcoin). You can use other methods such as “We’ll pay people to run validators” or “People sign a contract to run validators and behave”. Because of bitcoin’s ‘public’ structure, it needs a defence against miscreants and so uses “proof of work” to make it computationally difficult to add a block (see Defence section). This has created a cost (equipment and running costs) of mining and therefore a need for incentivisation. Just as the price of gold determines how much equipment you can spend on a gold mine, bitcoin’s price determines how much mining power is used to secure the network. The higher the price, the more mining there is, and the more a miscreant has to spend to bully the network. So, miners do lots of mining, increasing the difficulty and raising the walls against network attacks. 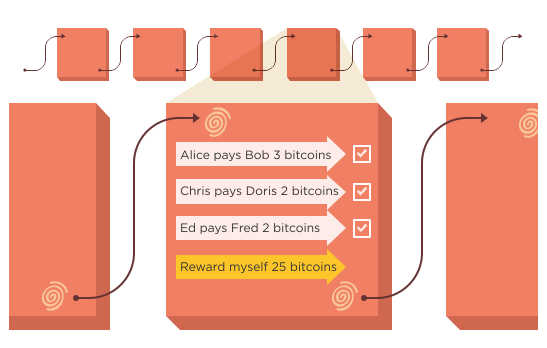 They are rewarded in bitcoin according to a schedule, and in time, as the block rewards reduce, transaction fees become the incentive that miners collect. 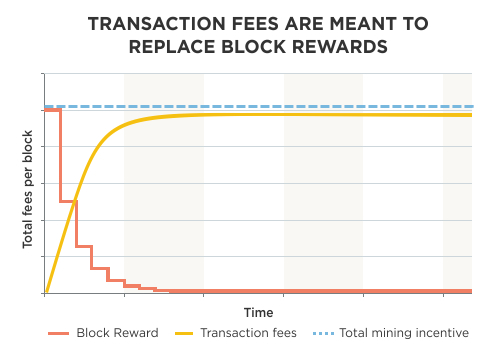 The idealised situation in Bitcoin where block rewards are replaced by transaction fees. It is useful to understand blockchains in the context of bitcoin, but you should not assume that all blockchain ecosystems need bitcoin mechanisms such as tokens, proof of work mining, longest chain rule, etc. Bitcoin is the first attempt at maintaining a decentralised, public ledger with no formal control or governance. Ethereum is the next iteration of a blockchain with smart contracts. There are significant challenges involved. On the other hand, private or internal distributed ledgers and blockchains can be deployed to solve other sets of problems. As ever, there are tradeoffs and pros and cons to each solution, and you need to consider these individually for each individual use case. If you have a specific business problem which you think may be solvable with a blockchain, I would love to hear about this: please contact me. With thanks to David Moskowitz, Tim Swanson, Roberto Capodieci. Errors, omissions, and simplifications are mine.